Recreating Chinese-American food classics at home: What’s the point? Can’t you just get delivery? I’ll tell you the point: it’s healthier, tastier, and cheaper. (I won’t say “faster” because that’s just silly.) Case in point: this beef with broccoli and scallions with loads of roasted broccoli and extra scallions. Believe it or not, the standard kitchen in China does not include an oven, so you’re verrrrry unlikely to find roasted broccoli in a Chinese-American dish. But it’s delicious: the roasting brings out savory notes and crunch that adds extra dimensions to the whole dish. Greasy take-out, no way. I really amp up the amount of broccoli here for delicious healthfulness, and sweet scallions make everything better. Pro-tip: put the beef in the freezer for an hour or two before slicing to make it easy to get the perfect thin slices. And the marinade slash sauce comes together in the Magic Bullet in no time flat. 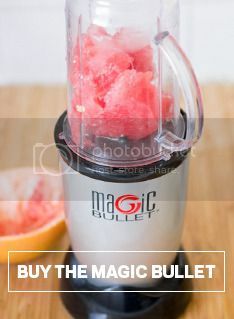 At least 30 minutes in advance, blend the garlic, vegetable oil and salt in the Magic Bullet. Toss with the steak in a sealed container and refrigerate for 30 minutes to 12 hours. Preheat oven to 450 degrees. Toss broccoli and scallions with a dash of oil and salt and roast until crispy and brown. Add a dash of oil to a large skillet over high heat. Add the beef with the marinade into the pan, using a big dash of water to rinse out the container and add that to the pan too. Cook until beef is just cooked through, about five minutes. Toss broccoli and scallions with beef. Serve over rice. Fennel is… strange. The middle of it looks like celery, the top of it (the “fronds”) look like Muppet hair, and the bottom like… fennel. And the whole thing tastes like licorice. And then there are fennel seeds, which also sort of taste like licorice, or maybe like anise? And where do the seeds come from? Anyway, put aside your fennel confusion, because it turns out that chopped fennel makes a tasty, crunchy, vaguely licorice-y salad, especially when dressed in this delicious dressing of tahini, roasted garlic, and smoked paprika. The smoked garlic provides richness, caramelized notes, and deep flavor, the tahini provides a subtle sesame flavor and more richness, and the smoked paprika spice adds smokiness. And it all comes together in a just a few minutes (well, after you roast the garlic). I use griddled squid in this salad, which provides nice chewiness and squid’s distinct sweet seafood flavor, but really you could use any protein, like shrimp, tofu, an egg, or nothing at all. Roasted chickpeas provide crunch, flavor, and fiber. Let the garlic cool, remove the cloves, and blend the garlic, tahini, paprika, and lemon juice in the Magic Bullet. Add water just until you have a salad dressing consistency. Roll the chickpeas in olive oil and salt and roast in the oven until crispy, about twenty minutes. Cook your protein as desired (I griddled in a pan, but you could also roast). Mix dressing, fennel, chickpeas, protein, and tomato. Serve, garnishing with fennel fronds. Yeah, that just sounds good, doesn’t it? This recipe features a bunch of delicious tasting notes: miso and umami are salty, honey is sweet, butter is rich, and when the combo hits the chicken and is roasted, it creates a flavorful, crispy skin. The miso, though a bit of an exotic ingredient, really blends into the background here, creating a rich and beguiling flavor without being noticeably unusual. Your kids will love it (if you have kids). The Magic Bullet does a great job of blending up the marinade, which you then smear under and on the chicken skin. I used chicken legs here (it was weeknight), but thighs or even a whole bird would be equally delicious. The idea for this recipe came from food52. Preheat oven to 400. Blend all the ingredients (except the chicken!) into a cream using your Magic Bullet. Put the chicken legs into a baking dish and pat dry with paper towels. Using a knife or your hands, pull the chicken skin so that it’s not attached so firmly, then take a spoonful of the miso-honey butter and spread it underneath the skin. Repeat with all the chicken, then take whatever miso-honey-butter is left and spread it on the outside of the chicken skin. Roast in the oven for 35 minutes or until the chicken is done. (I use a meat thermometer.) Don’t flip during cooking (to preserve skin). Herb butters are on my brain lately, after making an incredibly good one-pan meal of pork tenderloin the other day. I try to eat at least a few meals of fish each week and am able to get great herbs at the farmer’s market this time of year, so I turned to my Magic Bullet to create a quick, easy and delicious salmon dinner. The key to this meal is the mixture of acid, fat, and flavor. The herb butter melted over the salmon after cooking turns this meal from everyday to extraordinary. A quick tip on salmon: I recommend “dry brining” it. All that means is put the salmon in a bag with salt and refrigerate it for at least 30 minutes before cooking. This does wonders for not only seasoning the fish and adding flavor but it also makes the meat juicier. Rub the salmon all over with salt and put it in a plastic bag. Move to the refrigerator for at 30 minutes and 12 hours. Meanwhile, blend the lemon peel in the Magic Bullet. Blend the garlic and add the tarragon and chives. Blend. Add the butter and blend. Add a big squeeze or two of the lemon juice and blend again. Heat a nonstick pan over medium heat. Add a glug of oil to the pan. Remove the salmon from the bag and wipe the salmon down with a paper towel. Add the salmon to the pan and cover. Cook, flipping occasionally, until the salmon is cooked through to medium-rare. Move the salmon to a plate, cover with the herb butter, and tent with aluminum foil. Serve when the butter melts. It’s spriiiiiiiiiiiiing. Finally! Actually not really, we had a pretty mild winter here in DC. Anyway, though, you can get stuff at the farmer’s market in spring that you can’t get any other time of year. Like ramps! OK, if you’re over ramps, I don’t know what to tell you — I see the point but I think they’re delicious. And if you combine ramps with their springtime partner asparagus, you get a once-a-year treat that takes a bowl of plain pasta to a whole new level. This all comes together extremely quickly in the Magic Bullet after a quick blanch in boiling water (which can then be used to cook the pasta, hey-o). Of course, you also could just eat the pesto with a spoon. It’s that good, and hey, it’s mostly asparagus, so no shame. I like to eat it with pasta and salted tomatoes, if you can get any good ones where you live this time of year. Pro tip: top with soft-boiled egg. Bring a pot of salted water to boil and add the asparagus. Let it cook for a minute or two, then add the ramps for about thirty seconds and remove everything with a strainer, reserving water to cook pasta. Blend the parmesan in the Magic Bullet. Remove to a plate. Blend the walnuts in the Magic Bullet. Working in batches, blend the walnuts, cheese, and ramps and asparagus in the Magic Bullet with plenty of olive oil and a pinch of salt and lemon juice. Add the end, mix everything up and taste for salt. This delicious chicken dish is both savory and hearty without being too heavy. The mustard and balsamic vinegar sauce brings together the tartness of both the mustard and the vinegar while really cutting through the richness of the chicken. Best of all, the sauce all comes together in the Magic Bullet with minimal work and fuss. In a large oven-safe pan, add a glug of olive oil over medium-high heat. Add the chicken legs and cook until well-browned. Preheat oven to 350. Meanwhile, blend the garlic in the Magic Bullet. Add the honey, the mustard, and the vinegar and blend. Add the sauce to the pan all over the chicken and stir. Move to the oven and cook until the chicken is cooked through. Sometimes you want a dinner that brings you completely new and different flavors, and sometimes you want to rearrange familiar flavors into something delicious and straightforward. This pasta dish takes the latter approach, taking a classic Spanish tapa — shrimp with garlic and pimenton (smoked paprika) — and turning it into a tasty pasta. I came up with the idea after getting some beautiful, large raw shrimp at the supermarket. This all comes together in under twenty minutes and is quite good: the garlic butter spiked with pimenton and juices from the shrimp serves as a perfect sauce for the pasta, which absorbs lots of delicious flavor. Cook pasta in heavily salted water until al dente, reserving about a cup of pasta cooking water. Add garlic to the Magic Bullet and blend. Add pimenton and blend. Add the butter to a large skillet over medium heat. Cook until butter melts, then add the the garlic-pimenton and cook for a few minutes, just until garlic is translucent. Add the shrimp and cook until shrimp is just cooked through (shrimp will change color). Add the pasta to the skillet with about half of the pasta cooking water. Stir everything and let the pasta absorb the sauce. If the pasta is dry, add more pasta cooking water. Serve. If you’re tired of the usual chicken-beef-pork routine, here’s an easy recipe to mix things up. Lamb shanks are inexpensive and make a delicious, rich, different-but-not-too-crazy meal. Braising them in pomegranate juice and honey provides a delicious sweet-and-sour sauce that is just perfect over couscous. The sauce comes together easy in the Magic Bullet, and I bet your family will be surprised at just how easy it is to devour something a little different. Blend garlic in Magic Bullet. Add pomegranate juice, vinegar, and honey and blend. Preheat oven to 250 degrees. Add a glug of vegetable oil to a large dutch oven over medium-high heat. Rub salt all over the lamb shanks and add them to the dutch oven. Cook, turning frequently, until well-browned and set aside. Add the onions with some salt and cook until the onions are beginning to brown, about eight minutes. Add the juice mixture and scrape the bottom of the dutch oven. Raise the heat to high and bring everything to a boil. Add the lamb shanks bank to the dutch oven with their juices. Cover partially with a lid. Check periodically to make sure liquid remains (if not, add some water). Cook for approximately three hours or until meat is appropriately tender. Remove the shanks from the dutch oven. Pour the liquid into a small pot, trying to avoid rosemary seeds or any other solids. Bring liquid to a boil and reduce until syrupy. Serve shanks with sauce over couscous.